Apartment Serene Nest is a trendy property with bright, clean and spacious interiors, located in Hanuman Nagar, Kothaguda, in Hyderabad. The Kondapur Bus Stop and Hitech City MMTS Station Railway Station are close to the property. It is close to Whitefields, Sai Baba Temple, and Laxmi Cyber City. The property boasts of a spacious living and dining area with tasteful furniture. The rooms are also large, done up in soothing hues, and have big windows. Bright bed linen and curtains add to the appeal. 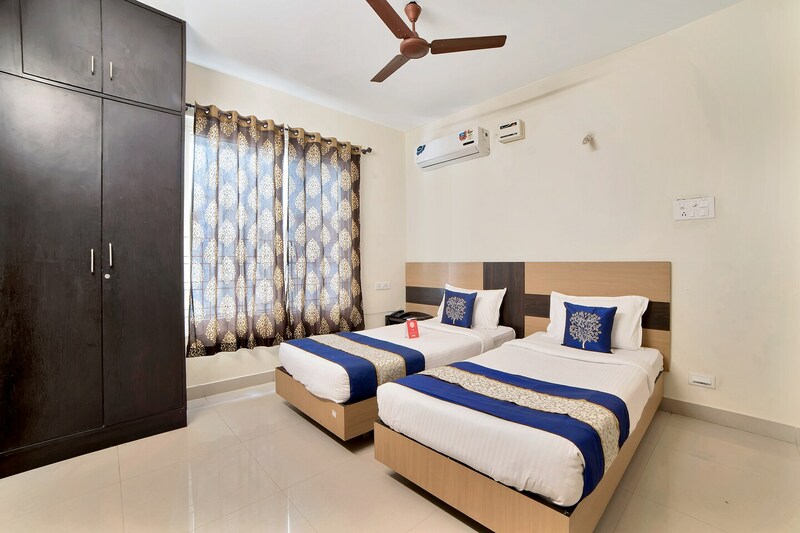 TV, AC and seating area are provided in all rooms. The bathrooms are modern, have stylish tiles and the latest fixtures, including geysers. The other facilities include power backup, elevator, CCTV coverage, parking, card payment facility and laundry services. Eateries like Kesariya's, Punjabi Affair, Club8, The Spice Village and Parathas & More are in the close vicinity of the property.